Made by Joseph Box Ltd in England, 1868-1923. 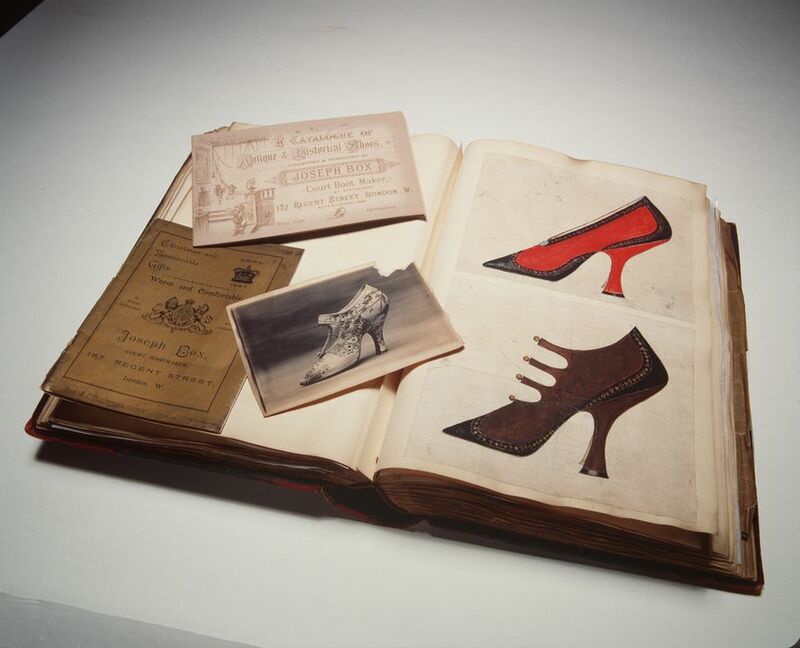 This archive of Joseph Box, court shoemaker of London, consists of correspondence and scrapbooks concerning Box's exhibitions of boots and shoes, 1889 and 1921; printed catalogues of Box's and other manufacturers' shoes, 1883-c1910; drawings of shoes, c1898; and books and magazines relating to shoes, 1868-1917. This Joseph Box shoemaking archive is part of the Museum's significant Joseph Box collection. Joseph Box Ltd had its origins in a London shoemaking business established in 1808 by a 'ladies shoemaker' called James Sly. From 1816 Sly's apprentice was Robert Dixon Box, the fifteen-year-old son of a bankrupted Quaker attorney. Box was to become manager of the business when Sly died in 1826, and gained a reputation for fine shoemaking through its participation at international exhibitions and by obtaining Royal Warrants. The business became known as Joseph Box Ltd in 1862 after it was transferred to Robert's son, Joseph. Like his father, Joseph started in the trade at the age of 15, but retired at the relatively early age of 42 to enable his daughters to enter society. Although he transferred the business to his cousins the Box Kinghams in 1882, Joseph maintained an active interest in shoemaking through collecting. At the end of the century the business was later taken over by royal shoemakers Gundry & Sons, which was itself taken over by John Lobb Ltd some time after 1953.